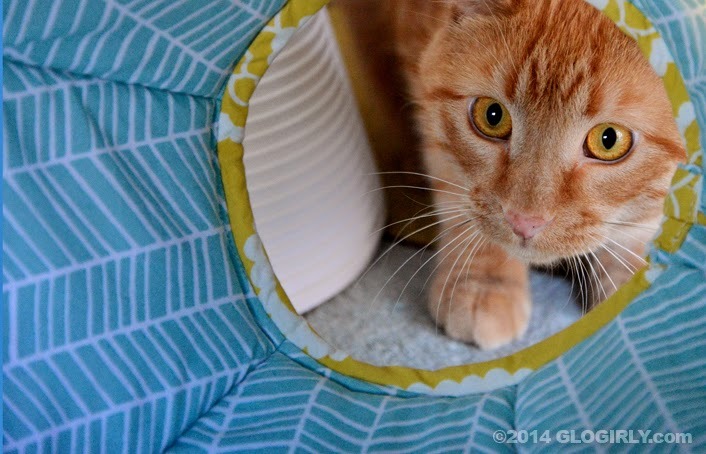 GLOGIRLY: Hidey-Hole Fun with The Cat Ball & a GIVEAWAY for You and Your Shelter! 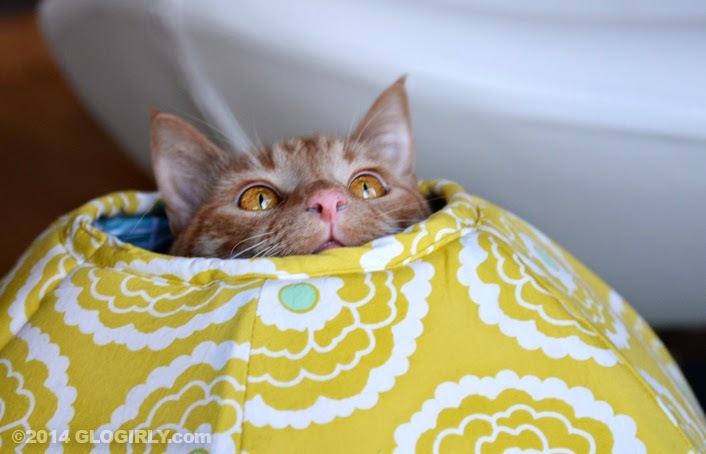 Hidey-Hole Fun with The Cat Ball & a GIVEAWAY for You and Your Shelter! WAFFLES: Hey Boss! Where'd you go? WAFFLES: Boss! I'm waiting! When are we going to play with my Cat Ball??? KATIE: Did you say YOUR Cat Ball? WAFFLES: Um... OUR Cat Ball? KATIE: Try MY Cat Ball. WAFFLES: That's what I said! MY Cat Ball! KATIE: Waffles, not EVERYTHING in the Townhouse, or the entire world for that matter, is yours. A purrfect playground for chasing, twirling, hiding and bunny kicking. A small hole on one end and a large on the other mean ANY kitty can fit! Soft fabrics and padding make the Cat Ball cozy enough for a quick nap or a long snooze. The completely original designs fit beautifully into any decor, especially our modern townhouse. 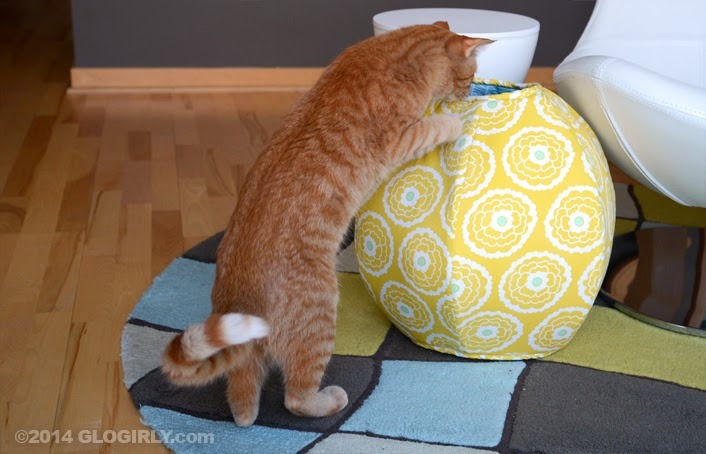 Each Cat Ball is made by hand and the quality is top notch. The Cat Ball collapses almost flat for shipping and storing (not that you'd EVER want to store it!) and just pops open into a perfect ball on it's own. In addition to the Cat Ball, there are Cat Canoes too! Everything is available in a wide range of fabrics, patterns and colors. The Cat Ball is a small, independently operated business run by a talented cat-loving designer named Jennifer. • One lucky reader will win a Cat Ball of their choice for themselves AND one for their favorite shelter. • Visit TheCatBall.com to start drooling over all the cool choices! BUT WAIT! THERE'S MORE! ... a Special GLOGIRLY Discount! • Glogirly readers can save 15% on their purchase now through July 4! Jennifer, the delightful human behind the Cat Ball, actually got her start in apparel design and pattern making. While working as a costume designer, she was hired to make a human-sized ball costume. Not your ordinary, everyday request...so she first made a mini ball as a prototype. Well add a few kittens into the mix, some soft padding for the ball and voila! ...the Cat Ball was born. 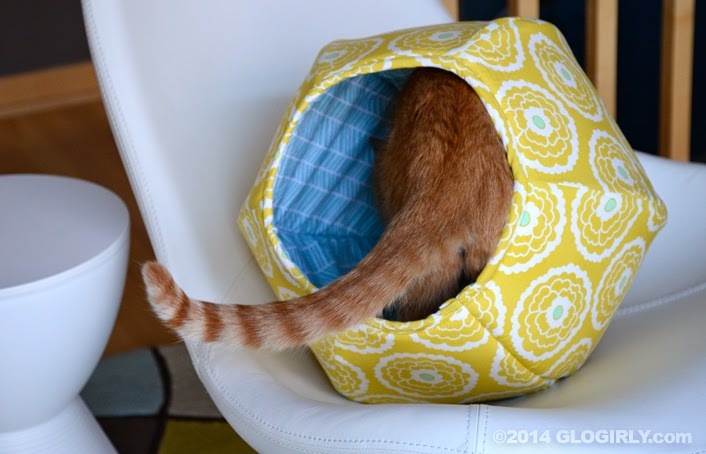 FTC Disclosure: We received our Cat Ball at no charge to try out and review. We also received a small fee to cover the time it takes to take photos and write the review post. Receiving the Cat Ball and the fee did not influence our article or anything we say. All sponsored posts on GLOGIRLY will always reflect our honest and unbiased opinions. A ball of Waffles. What more could anyone want? That cat ball looks like it is SO worth trading smacky paws over! This looks really cute and I think my cat would love it. Great giveaway as always! These are SO cute! Thank you for the chance to win! Furryboy and the Grouch (my iteration of the Waffles and The Boss) would love to argue incessantly over this! I can see Rags rolling it across the dining room like those giant bubbles. I own a Cat Ball and can say that my cat absolutely LOVES it! He sleeps in it and plays in it throughout the day. I would love to win to give one as a gift and for my favorite rescue to receive one too. Thanks for the great giveaway! It looks sooooooo cozy & comfy!!! That looks like so much fun. You guys are so lucky, you get to try out all the awesome things! I want one of these so badly!!!!! My cats would love the one with the polka dots. What great story! The birth of Cat ball. Oooooh! These look so cool! While all three of our cats would like this, my daughter's kitten, Arata, would absolutely love it and use it all the time. No open bag or box is safe from him in our house. LOL! So cool, my kitties would love these! Hmm, I don't think I'd fit... But I bet my kitty siblings would, and they'd sure have fun in it! Oh my, my kittehs would have fun with one of these. Thanks for a chance to win. WOW! My kitties would just LOVE playing with that! SO glad to hear it is open worldwide too!!!! I love how you are giving to the shelters as well! My little girl would love this ball. She likes to hide and jump out at her big brother. We just adopted a little guy and named him Winston - and I know Winston would love this hidey hole cat ball! I’m on a lucky streak so what the heck. I can attack TW out of either side. TW loves that Dr. Seuss print but I like blue. I bet the AC$P Cat Sactuary doesn’t care what color they get. MOL! This might actually be something my kitties would play with. If I buy one more thing that they ignore my husband will kill me - so I need to win it. OMC! How we would love to have one of those! 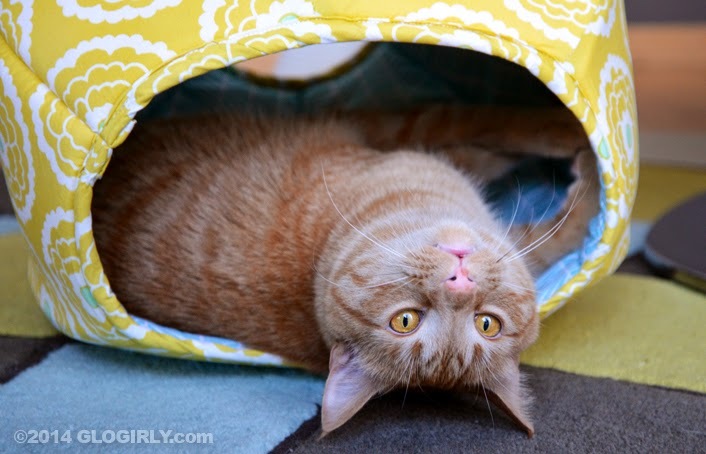 Very nice looking cat hide out- beautifully modeled by Waffles! It would be fun to have one and certainly a nice dilemma to decide which room at PAWS would get one! These balls look so comfy! I would love to have one for my little Dessa cat. That's pretty dang cool! Thanks for the chance to win one! That cat ball looks very fun!!!!! So cute and Waffles you are adorable! What a great idea! We'd all love it, I'm sure! Ooooh Abby would LOVE this...and we would love watching her love it!! You talked me into it, Waffles. I ordered two balls. Yes, there are three cats here, but, if everybody has their own, they won't have any fun, right? BTW, the last picture in this post is totally priceless - I sure would like to know how you guys do this. And, OK, Waffles, we have a cat at Feline Rescue right now who looks just like you - even the desiger tail. Now, don't get all foofed up, but his name is Einstein. Really. 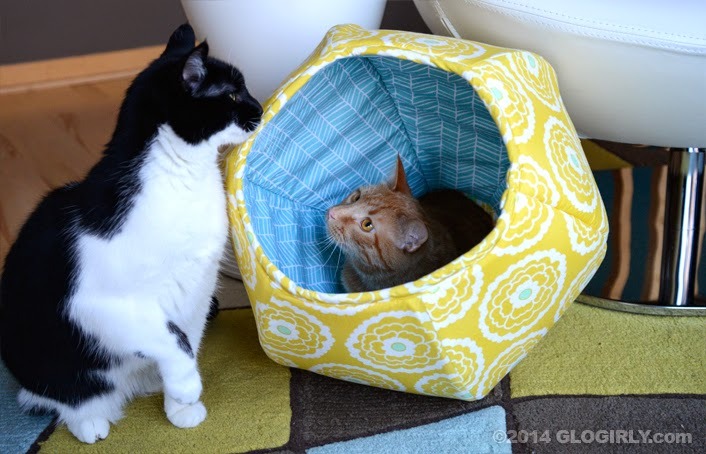 We thinks Scylla & Socks could both fit in the cat ball if they wanted to. But we also thinks Scylla would chase Socks out. Oh! My cats would love this, specially Romy and i love those colors! Wow! This looks like a LOT of fun! I'd love to win a cat ball for my gang. They'd love this. My kitties would love that. Looks like a lot of fun too.Thanks for the giveaway. That ball is PAWESOME! Waffles, we would have a hard time sharing it too. Neat! Our kitties would love that! Love the captions! Thank you for the chance to win - this would be adored by the kitties here! That looks like the perfect place to stage an ambush! I think this would be come a favorite of my cat Desiree. Oh, how we'd love to win one of these for our shelter! They are SWIMMING in kit-cats right now! Well, not exactly SWIMMING... but there are a lot of kit-cats there right now. I love love LOVE the catball. So creative and brilliant! Ooh - I love the purple one, and it's even on sale! The Cat Ball is Amazing! We would Love to win one!! 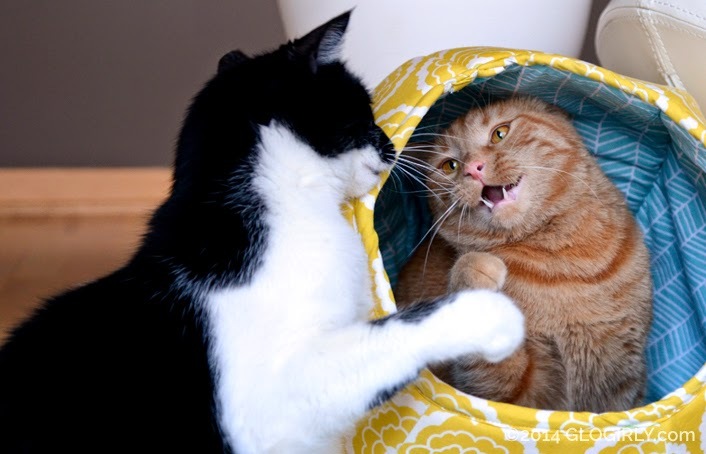 We would love to have a cat ball, of course we might have a problem similar to Waffles and Katie. The kitties at our local shelter would be thrilled to have one in the cat room. This looks like brilliant fun. My two would love this, but only one at a time! I wouldn't mind a human sized one myself as it looks like a great cosy place for a nap! WOW - who wouldn't want that cat ball. I've entered the contest and say thank you to Katie and Waffles for the opportunity to enter. Loved your pictures! That cat ball is all-around awesome! Yoshi Kitty would go nut for this if we were to win. Thank you for hosting the giveaway. I remember seeing this at Blogpaws and loved it but been so busy working at the shelter I haven't had time do as many giveaways. I will donate it if I win. These things are uber cool! love it! thanks for giveaway! Oh, we just gotta have one o dem. They look soooooo comfy. I think I'm too big for that ball. My cat would be crazy for this! Awwwww, my kitty would love this so, I pray that I win, really!!!!! Love the looks of these. What a purrfect spot for a kitty nap! Oh boy we want...Ok I want a cat ball! Gonna go look at the site right now too so maybe we can order one! this is awesome ! I could see my boys (yes we call the cats the boys ) loving this !! What a COOL thing! I don't currently have a cat, but I'm sure any of my friends with feline family members would love to have this! it's so adorable.my cat blu would definitely love that cat ball. I have lusted after that cat ball ever since I saw it on your blog. I am sure my kitties would love it. New reader here. And I'm so glad I caught this giveaway!! I'll be back heheh! Oo that ball looks like a lot of fun! Who wouldn´t LOVE to have a Cat ball ??!! There's a whole lot of feline fun happening with this amazing Cat Ball. Pekoe and Billy would have SO much fun with this! WANT! My cats would love to win this awesome giveaway for the cat ball. And they would love to give one to the kitties at a shelter. I think my cats would really like this ball. Looks like fun! I hope my cats can share. Anycat would love to have one of those. My cat would love to ply in there. Oh Wow how cool. Ya'll get sum of da coolest fings. What a cool prize! My Hutch would love it...and the shelter I do photography for (to use on their social media) would love it too! My cats and the foster kittens who often stay at my house would be thrilled to have one of these! my 3 kittens would go crazy!!! Awesome, awesome, awesome! I can totally see my cats using this! We have a lot of fur kids here who would adore this hideaway! Madison & Simba would love to fight over this Cat Ball. Would love the chance to win it for my furkids. That cat ball looks like a lot of fun! I think Truffles would *love* this! My cats would just love this. My 12.5 year old died almost 3 weeks ago, but before he passed away he'd been sick for over a year. During his illness he soiled all the pet beds and I had to toss them. Thank you and Cat Ball for such a wonderful giveaway! I would like for my babies to win but I would love for my shelter to win. 4 Paws Rescue in Youngtown, AZ. I have 2 rescues that I adopted from them. They are great shelter for cats only. They wander around the shelter sitting on the desks and generally just be themselves. They eat, play, and wait patiently for their forever homes. We would like to win! That cat ball looks pawsome. And we think [our] shelter cats would love it too! Looks like lots of fun ~ Jerry would love it!